Elderberries are said to increase immunity, fight colds, flu, and sore throats. They they are a rich source of lots of healthful components: bioflavonoids, antioxidants, potassium, beta carotene, calcium, phosphorus and vitamin C.
First things first: find a source of elderberries, orSambucus nigrans. They're very easy to grow, but you can also buy dried berries, or ask around to see if a neighbor or friend has an elderberry shrub growing that they don't use. Make sure to make a positive ID before you pick, though! Bright red berries are a different type of elderberry that is toxic. You want dark purple to blue-black berries. And, all elderberries are toxic if eaten raw, so please follow these recipes carefully! 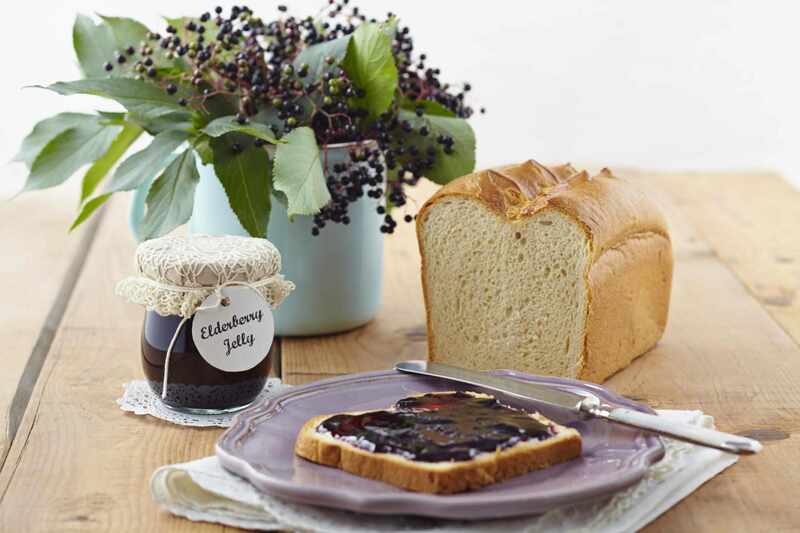 This jelly is easy to make and tastes delicious. Open up a jar in midwinter and the bright ruby color will wake up your senses. It's great spread on toast, bagels or crackers. And you can feel like the antioxidant, antiviral properties of the elderberries make up at least partly for the sugar content! This recipe requires a water-bath canner, or you can make a smaller amount and refrigerate it -- it will last at least a few weeks in the fridge if not a month or two. This recipe makes a medicinal elderberry syrup (although it's also delicious on pancakes, waffles or fruit!). With raw, local honey, the healing properties of this mixture abound. By the spoonful for sore throats, colds, and flu, you will want to keep a good quantity on hand for the winter. Although I wrote the recipe to be kept in the fridge, you could always sub sugar for the honey and water-bath can it like the jelly. I find that it's easy enough to refrigerate it and we will use 36 ounces in the course of a winter. Another option is to can the juice itself, with no sugar, and mix it fresh as you need it during the winter. If you don't mind using alcohol, elderberry tincture is a great way to reap the medicinal benefits of elderberry in a concentrated, potent form. This classical herbal preparation extracts all the goodness from the elderberries and leaves you with a strong, medicinal tincture that can be used against viruses throughout the winter. Enjoy! Please note: The information contained in this online site is made available with the understanding that the author and publisher are not engaged in rendering medical, health, psychological, or any other kind of personal professional services on this site. The information should not be used in place of a call or visit to a medical, health or other competent professional, who should be consulted before adopting any of the suggestions in this site or drawing inferences from it. The information about the herbal preparation contained on this site is general in nature. It does not cover all possible uses, actions, precautions, side effects, or interactions of the medicines mentioned, nor is the information intended as medical advice for individual problems or for making an evaluation as to the risks and benefits of taking a particular drug. The operator(s) of this site, and the publisher, specifically disclaim all responsibility for any liability, loss or risk, personal or otherwise, which is incurred as a consequence, directly or indirectly, of the use and application of any of the material on this site.